[German]Security provider AVAST has released version 5.45 of the CCleaner (the product was taken over from Piriform). Version 5.45 comes with extended telemetry data acquisition, that caused a lot of negative feedback. Now AVAST explains the situation and promise amendments. Addendum: CCleaner version 5.45 has been pulled. 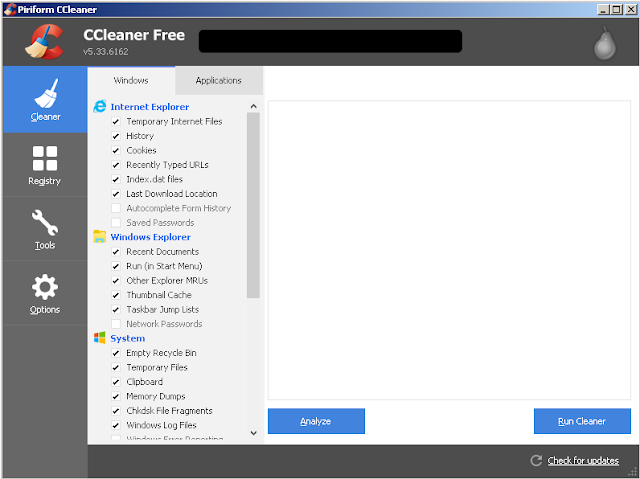 CCleaner was developed by Piriform as a tool for Windows and offers a number of features for cleaning and optimizing the operating system. Many Windows users love this free program – it has ‘magic functions’ that can even teach a lame Windows to become a ‘racing horse’ – is rumored at least in forums. In my view, CCleaner is associated with that ‘smells like trouble’, I’ve seen too many broken Windows systems after user executed this tool ‘to optimize Windows’. However, it should be noted that Piriform, the developer of CCleaner, was acquired by the Tchech antivirus manufacturer AVAST in summer of 2017. This is nothing bad per se, especially since Piriform continues to work (at a first glance) independent. But since the takeover by AVAST things seems went worse. I remember the episode in 2017, where a CCleaner version with malware was distributed (CCleaner has been infected with malware). And I wrote blog posts (see link list at the end of the article) in which I warned of potentially unwanted software (AVAST) in CCleaner-Installer. Now AVAST has released the CCleaner version 4.45 via Piriform. And within this version, the already existing analysis feature (Active Monitoring) were strongly extended. In other words, telemetry data acquisition has been expanded (the keyword is probably the heartbeat function, an anonymous analysis function). The site techdows.com has taken up this topic in an article. This was not well taken by users, so that the developers feel to defend their decision in a Piriform forum post. Under the title Changes in v5.45 and your feedback, the developer explained what has changed and why. The developer confirms, that since the release of the new version, many users send their feedback. And the poster says ‘we have been listening’. Concerning the user’s fear, that CCleaner might be accessing and sharing personal data, the Piriform forum moderator wrote. To be clear, CCleaner does not collect any personal data. Some of you told us that you do not want to share even anonymous usage data. After listening to your feedback we realize we need to provide you with a better level of control for anonymous data collection. Back to v5.45, and to what we have learned: combining the new analytics with the Active Monitoring feature was quick to implement, but it doesn’t offer a lot of flexibility in terms of controlling these distinct items separately. Lesson learned: simplest isn’t always best. Based on user feedback, Piriform wants to give users (in the future releases) better control over the analytical data collected. Piriform will separate the Active Monitoring (junk cleaning alerts and browser cleaning alerts) and heartbeat (anonymous usage analytics) features in the UI. They promise the ability to control these individually. Users will have the options (in future releases) of enabling all, some or none of these functions, and this functionality will be uniquely controlled from the UI. Piriform will take this opportunity to rename the Advanced Monitoring features in CCleaner to make their functions clearer. Piriform will eliver these changes to the software in the coming weeks. Users don’t like the last sentence as much – one writes that it sounds like ‘words, generated by lawyer bots’ and announces it’s CCleaner’s departure. Other users recommend withdrawing version 5.45 and offering the previous version for download until the revision is complete. This entry was posted in Windows and tagged Software. Bookmark the permalink.